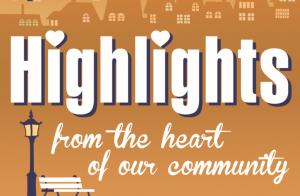 The show airing April 1, 2019 – April 8, 2019 ‘highlights’ the T Rex Science Center & the St. Albans Parks & Recreation Department. We interviewed Jeff Mason, Co-Partner, and Angelica Armstrong, Director of Marketing for the T Rex Science Center. This is new museum set to open in April of 2020. Jeff talked about the concept of the project. It is in the former Purity Maid Bread factory on Charleston’s West Side and will soon be the home to the T-Rex Science Center, a dinosaur-centric science and activity center for children and families. Inside the old factory’s former loading dock, the floor has been leveled and smoothed out. Already, there are giant-sized prehistoric animal fossil models — a Tyrannosaurus rex and a mammoth. Angelica discussed funding and how they are accepting donations through their ‘Buy a Brick’ campaign. Call 304-400-2706 to learn more. The mission of the T Rex Science Center is to provide experiential pathways in lifelong learning in science and the arts for children and adults through exhibits, programs and hands on experiences. The T-Rex Science Center is a 501(c)3 non-profit organization that seeks to be the defining hub and preeminent advocate for educational exploration through Science, mathematics, arts, research, technology, engineering and responsibility (SMARTER) concepts. She also talked about an exciting day for the whole family. Dino Day is scheduled for April 13, 2019 at the Charleston Town Center Mall from 11:30 -1:30 in Macy’s Court. Come and meet the friendliest monster at the Mall! Mr. T-Rex will be prowling around and ready to make new friends. They hope you’ll be one of them! 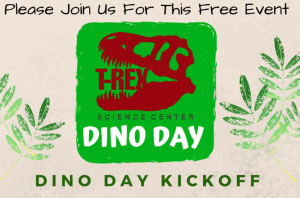 Join them for the Dino Day kickoff to learn more about the upcoming T-Rex Science Center, ACTIVITIES, GIVEAWAYS and MORE!! We also interviewed Debbie Keener, Volunteer and Kevin Pennington, Superintendent of St. Albans Parks & Recreation. They discussed their upcoming event the 6th Annual ‘Take a Walk on the Wild Side’ Nature Hike schedule for April 6th at the St. Albans City Park from 9-1:00. To learn more call 304-722-4625. There will be plenty to do for the whole family. NO CHARGE to attend.